Please welcome Terry Newman to the blog! 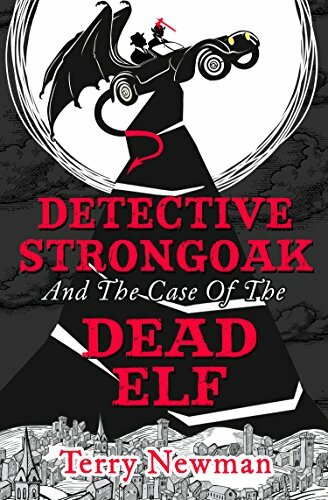 He kindly chatted with me about his new book, Detective Strongoak and the Case of the Dead Elf, and more. Also, when you finish reading this, head over to SF Signal and read Terry’s fantastic guest post. Terry, will you tell us a bit about Detective Strongoak and the Case of the Dead Elf and what inspired you to write it? A Dead Elf (affectionate name) is a fantasy, comedy, detective novel, unless it’s a comedy, detective, fantasy novel of course. Or maybe it’s detective, comedy, fantasy! Look – it’s funny and there’s a real murder to be sorted out and it all takes place in the Citadel, which is a seething metropolis in Widergard and is full of elves, goblins, men, tree folk, trolls and gnomes. Oh yes and a smattering of dwarfs, like Master Detective Nicely Strongoak. Nicely is pretty damn cool, with impeccable taste in suits and hats. He’s got a mean way with a hand axe and a pithy rebuttal. It is true that the idea did come to mind when I first saw a sign for an Elf Service Station and thought: ‘that’s just like elves that is!’ However, I had long wondered what would happen in the average medieval-type fantasy world when they got rid of all the Royals, had an industrial revolution, introduced democracy and generally all had to get on with each other. It might just end up being a little like Raymond Chandler’s California, but with steam wagons, because they’re better. And I don’t think you can take that scenario too seriously really. You have a background in biomedical research, but have you always wanted to write fiction? Will you tell us a little about that progression? I have always written stories. In fact I can definitely say I wrote my first story long before I did my first experiment – probably. Oh yes, there was that one time, but we’ll call that youthful exuberance and nobody was permanently maimed. I read stories, I made up stories with the characters I read, and I invented my own. And no, I wasn’t an only child, I had no childhood illnesses that kept me bedbound for months and certainly wasn’t socially compromised in any way. I just read. I even read while watching TV and walking – still do. At some point though I realised that there was little chance of pursuing my scientific interests in my spare time (without criminal charges), whereas I could always write in this hypothetical ‘spare time’. I never actually saw any spare time and so everything relied upon Toshiba inventing the Libretto. This was a fantastic early Netbook, about the size of a VHS tape (one for the teenagers there). It meant I could write anywhere: trains, buses – you name it. So, with full Word-processing power at my disposal, I could immediately fulfil my fiction writing ambitions, by the less-than-obvious route of writing jokes for the venerable British Broadcasting Corporation. The best joke I ever came out with was while demonstrating a freeze replication method to two technicians on a transmission electron microscope and involved the molecule fibrillin and Marfan Syndrome. You really had to be there. What kind of research did you do for Detective Strongoak? How does your creative process differ from writing for TV and Film to writing a novel? Nicely only involved reading some hundreds of fantasy, detective and comedy books and comics. Piece of cake – oh, Madeira, lovely. Now, the more serious question about creative processes is interesting. Each medium, has it’s own advantages, restrictions and rules to be respected. I love writing for the stage (especially black box) because of the intimacy and chance to be non-realistic. Radio is fabulous, because you can go anywhere. TV, especially long form, gives you a chance to really develop characters. Film gives you a whole story in 120 minutes. Restrictions tend actually to be artificial, or at least enforced by broadcasters or convention. Personally I love some of the experimental stuff, but also respect the ‘craft’ expectations, say, of a three-act structured film with inciting incident, major dramatic question, turning points and the rest. It’s a discipline – it’s like learning to draw hands. I always respect an artist if their sketches show they can do good hands. So, where does that place novel writing? I am tempted to say: it gives you the freedom to do what you like. However, there are still some restrictions too. If you want people to actually read your book. With detective novels you can’t cheat. Clues must be placed and please no last minute characters. Comedy books should be funny and fantasy books should take you somewhere else. That’s what I like from my fantasy anyway – new places to explore, new ideas and new thrills. Why fantasy? What do you love most about writing, and reading, in the genre? I’ve touched on this above: new places and new thrills! I love ideas too and when I see something I’ve never thought of or read before crop up in a fantasy I get really excited – and a great re-imagining of tradition tropes as well. Rather fond of intertextuality as it happens. As regards my own writing, I tend to have ideas arrive out of the ether. They are there, noisy boys shouting from the corners of my neo-cortex. And they want out in some form or the other if at all possible. The fact that so many are fantasy is either a wiring problem, or maybe they just shout louder! They are all the usual suspects of which fantasy and SF readers will be aware. I have a soft spot for Lloyd Biggle Jnr and alternative histories such as Keith Robert’s Pavane. I devoured Jim Butcher’s Dresden Files like a reefer fiend after midnight and mainstreamed the World War II Bernie Gunther Berlin crime mysteries of Philip Kerr. Whenever I need a real fix, I just go back to Raymond Chandler. All fantasy fans should probably read detective novels too. What are you currently reading? Is there anything you’re looking forward to this year? ‘Detective Strongoak and the Case of the Dead Elf’ was picked up by Harper Voyager as part of their Digital First initiative. It is one of 15 fantasy novels by ‘debut’ authors. I am currently reading the other 14, not through obligation but because they are all tremendous fun. Thoroughly enjoyable business this. OK, in an attempt to pretend that I don’t actually spend all my time writing (which I do) I made up several exciting hobbies. Naked sky diving wasn’t really that believable and the business with human felt is borderline illegal. I do write songs for musicals though, that may or may not be produced, and collect animation cels. I’ve got a ‘Daffy Duck’, you know? That makes me very happy. Wow! There’s another case for Nicely half written and Harper Voyager are currently reading a very different fantasy of mine. I’ve just completed the book of a fantasy/SF musical comedy called ‘Resurrection’ for a fantastic Canadian musician name of David Alter. I am so excited about this and hope it speedily finds a good home. Equally excited about an animation film for a Australian producer and a documentary I am involved with about a major UK sporting hero, And please keep your fingers crossed for the sit com currently with a major UK independent. I don’t miss my microscope so much these days, although I do still get nostalgic for a chill breeze bubbling off the liquid nitrogen. Detective Strongoak and the Case of the Dead Elf, interview, Terry Newman. The Finalists for the 2014 Nebula Awards Have Been Announced!